Sanur Beach in Bali, Indonesia, is one long beach - with white/off white sand. As you see in the video, the water is calm and protected. Once home to a great reef, it is mainly gone due to erosion and Indonesia "progress"; silt and pesticide runoff from construction. So for Sanur, lot's of nice sand, but below the surface there are many problems. 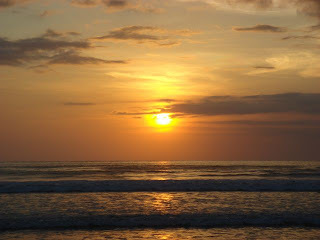 We were first interested in the beaches of Bali when a user e-mailed asking why we didn't include this beach. Unfortunately, this is one of the better beaches here. For some reason, probably corruption, these beaches do not get the treatment they deserve. There is little enforcement of the few laws Indonesia has for preservation. Feel free to comment. 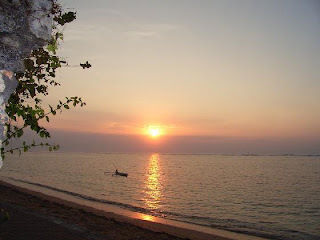 One of Southeast Bali's gems is Sanur Beach. With its small tourist population, Sanur is a very attractive. The surf is gentler than other areas of the island and the hotels are quite nice. In the past 20 years Sanur has developed into a great resort for tourists, feasting on the sights and sounds of the Indonesian countryside. Sanur is a very mellow town. There is an amazing contrast constantly going on here. There are hotels upon hotels, but there are also many aspects of the old village life going on as you will see when you find a place to stay. You may choose to stay in an 11-story hotel or you may choose to stay in a Balinese type resort. Aside from the accommodations, there are also many restaurants to enjoy near the beach. Indonesia is this way. Below is one of my favorite pictures; people relaxing around one of the temples in the area. What to visit: The Sacred Temple of Ratu Ayu of Singgi, located in the Grand Bali Beach Hotel. * Facilities - All included at the nearby hotels. Plus small stands that sell various items such as chessboards. * Sports - Parasailing, surfing, snorkeling, touring on glass-bottom boats, canoeing, jet-skiing, windsurfing, sailing and swimming. * Notes - can get crowded around major hotels.